We are happy to work with your school, cheer squad, dance team, band, et cetera to create the perfect school spirit item for your group. We offer many designs that will help your group exhibit their homecoming spirit! 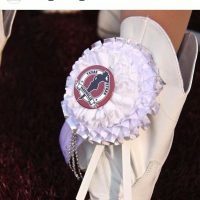 Visit our online store and pick out a mini mum, wrist corsage or spirit ring for your group. Message us via our Contact Us page if you have any questions. It doesn’t matter if you have a group of 10 or a group of 1000! We have you covered!